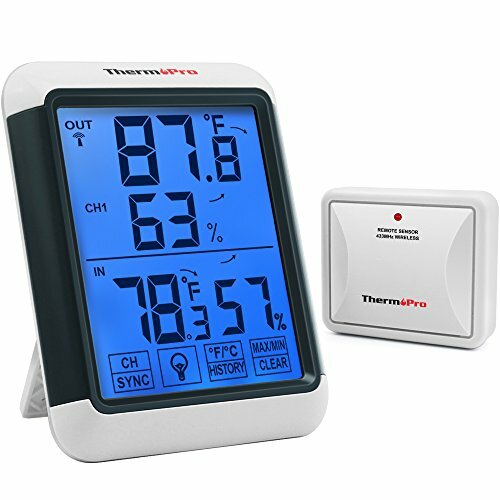 ThermoPro TP53 Thermometer Hygrometer features the ultra narrow frame on the market, making the LCD display/numbers enlarged to ensure you can read the temperature and humidity with ease at almost any distance! Coupled with the yellow backlight, you'll still be able to read the display with no eye strain even in the darkest conditions. 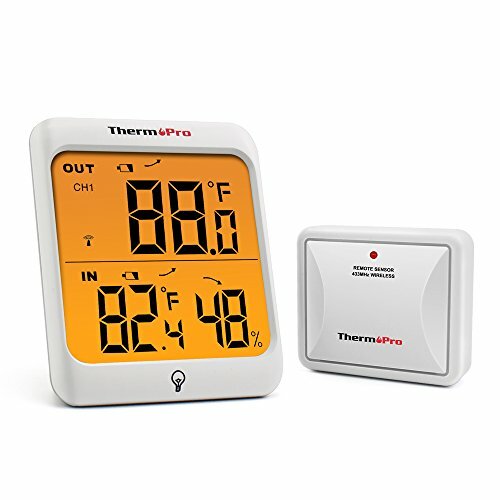 The indoor thermometer and humidity monitor is equipped with professional grade sensors to provide the most accurate measurements, be it for indoor humidity or temperature. 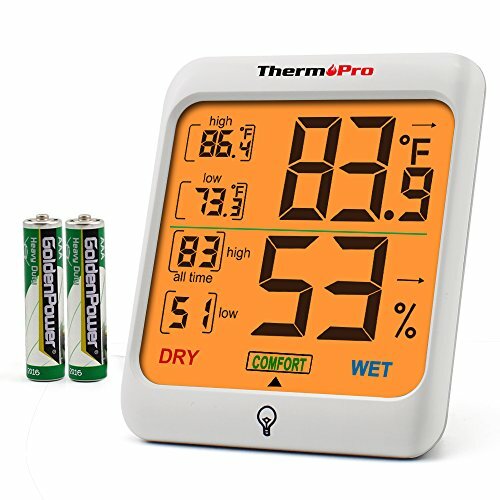 Also, the hygrometer features trend indicators, allowing you to be aware if adjustments are necessary for your household such as turning on your AC or humidifier. Buy without Risk!! Register your humidity gauge after purchase and RECEIVE EXTENDED 3 YEARS Warranty. 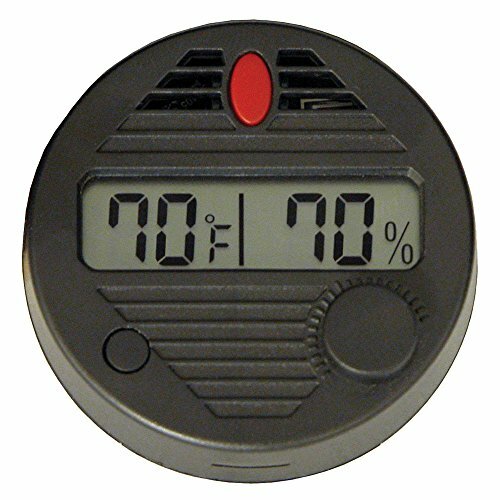 Round Digital Hygrometer with Adjustment Feature - Never wonder if your digital hygrometer is accurate. The HygroSet II is the first digital hygrometer of its kind capable of being adjusted after calibration. Each click of the adjustment knob changes the humidity display (+ / -) by 1-percent. Note: Quality Importers HygroSet II Round Digital Hygrometer is not compatible with exterior mount humidor models. Brand: Quality Importers Hygroset | Manufacturer: Quality Importers Trading Co, Inc. The Boveda One-Step Calibration Kit is a simple and surefire method to accurately calibrate any digital or analog hygrometer or humidity sensor. 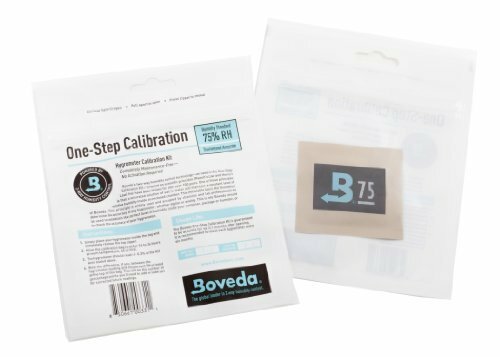 The One-Step Calibration Kit utilizes Boveda's 75.5% relative humidity standard, which is widely used and accepted by chemists and lab professionals to determine the accuracy of any hygrometer (also known as the \"salt test\"). Simply place your hygrometer inside the bag, close the zipper, and wait 24 hours. A perfectly-calibrated hygrometer will read 75% Rh. If your hygrometer reads above or below 75%, adjust the calibration by the number of percentage points it is off from 75%. Completely maintenance free - no activation required. Easy to use. Lasts approximately one year, good for multiple calibrations. Shelf life before opening is a minimum of 2 years.
? It is an easy-to-use, safe and reliable dual relay output humidity controller. Its play-n-plug designed: Plug it into wall socket, set your controller? ?s humidification or dehumidification values to your need. It can maintain the humidity between humidification and dehumidification automatically. In addition, the humidifier and dehumidifier can be programmed separately, too.
? The maximum electrical load is 10A. It can fit many residential humidifier and dehumidifier. It is widely used for mushroom, mini greenhouse, ventilator fan, crawl space, turtle enclosure, curing chanmber, snake cage, tobacco cage and so on. 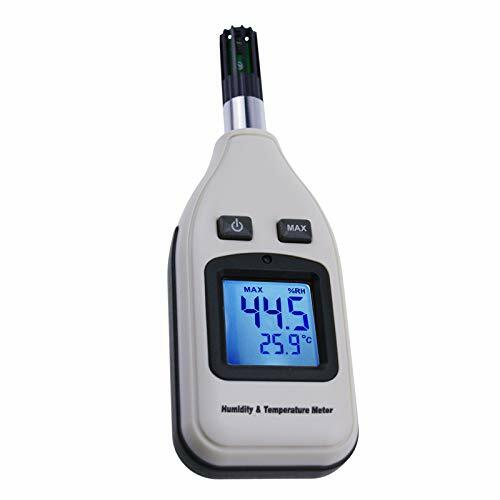 [Range & Accuracy] Humidity measuring range: 5~99.99%RH; Humidity control range: 5~99%RH; Accuracy: 3%RH. Please note that EEEKit and Amazon.com are the only sellers on Amazon that are authorized to sell products with the EEEKit name. Buy from sellers EEEKit or Amazon.com to ensure authenticity and better service. Product Description: There is a hole in the case to the circuit that is marked C/F . Please use a paperclip to press the circuit through that hole. It will switches from C to F.
Multipurpose! Embedded Installation Type! LCD Digital Display! Widely used in home, office, car, schools, hotels, laboratories, kindergartens, aquaculture, instrument workshop, libraries, schools, factories and places equipped with air condition, etc. The WiWo app under goes frequent updates to maximize the user experience. The WiWo app features a countdown, multiple timer function,multiple timer settings and scene setting. 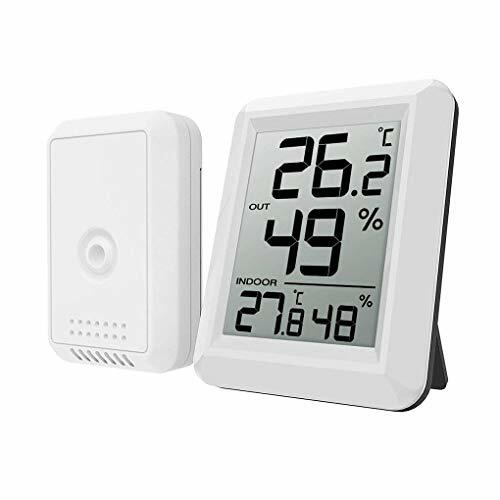 EASY READ & OPERATION: Temperature range is Celsius only on this model, bright and black front panel with a clear LCD display, easy to read even from a far distance. There is a hole in the case to the circuit that is marked C/F . Please use a paperclip to press the circuit through that hole. 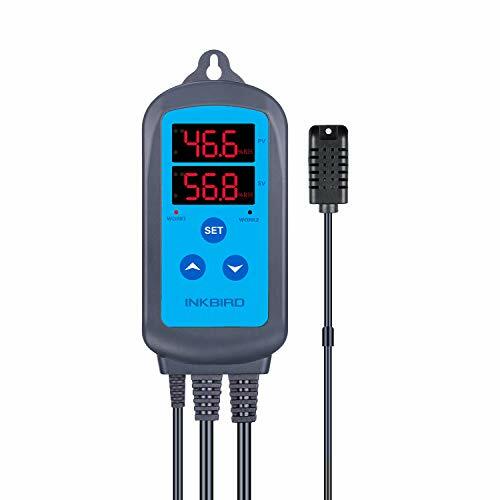 It will switches from C to F.
This digital meter features simultaneous measurement of humidity and temperature, high precision, quick response, high stability, and easy to carry anywhere. Widely used in the industry of agriculture, meteorology, household, lab, warehouse, air conditioning system, quallity control and other applications that require monitoring and checking of humidity and temperature. 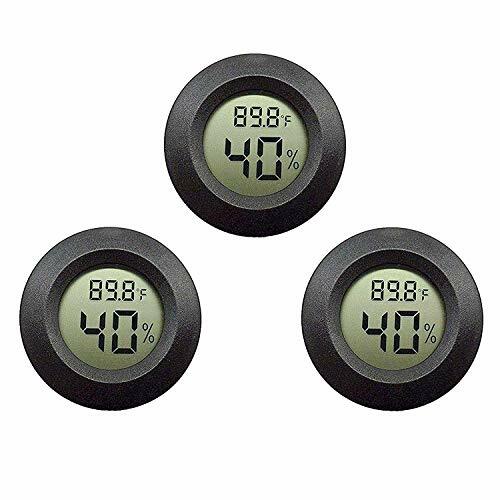 PROFESSIONAL AND ACCURATE -Humidity and Temperature Measurement with Accurate measuring: humidity range: 0% - 100%RH; Temperature range: -30 ~70 . SMART HOLD FUNCTION - You can write down the data by pressing the Hold key. So the results will not be lost, which can save your time and energy. Description Simple installation: designed with wall hanger and retractable stand at the back to put on any flat place. Just easily mount it on wall effortlessly or just place it on the table for using. Easy to change the temperature units to Celsius or Fahrenheit through the top button. Its layout is sleek and compact, which is widely applied in baby room, bedroom, home, basement, warehouse and greenhouse. Note: please do not clean any part of the product with benzene, thinner or other solvent chemicals. Specification: Type: hygrometer thermometer. Base station size: 7.5*6*2cm. Transmitter size: 6.8*5*2cm. Color: white, black, black base. Power supply: 2* 1.5V AAA battery(not included). Indoor temperature: 0-60 /32-140 F. Accuracy: 1 . Resolution: 0.1 . Outdoor temperature: -40 -60 /-104 F-140 F. Accuracy: 1 . Resolution: 0.1 . Indoor humidity: 10%-99%. Accuracy: 5%. Resolution: 1%. Outdoor humidity: 10%-99%. Accuracy: 5%. Resolution: 1%. Transmitter distance: 30-100m. Transmitter frequency: 433MHz. Note: There might be a bit color distortions due to different computers resolutions. There might be slight errors due to different hand measurements. Package included: 1* Hygrometer thermometer(battery not included). 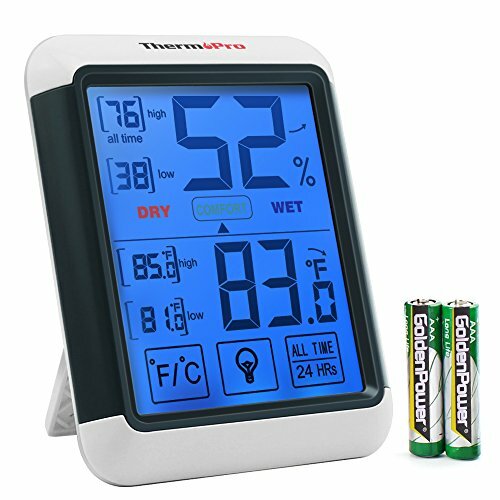 1* Thermo-hygrometer transmitter(battery not included). 1* User manual. Package Including . 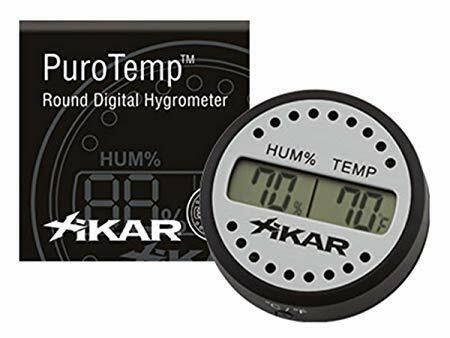 XIKAR PuroTemp round digital hygrometer has been designed for long term accuracy and minimal maintenance. They accurately display the relative humidity and temperature in your humidor. The size is a standard 1.75" so that it fits in the same hole as nearly every analog hygrometer that usually comes with a humidor. You can now upgrade your old analog to a digital with the XIKAR Adjustable Round Digital Hygrometer. Features: Accurate to +/- 2% at 70% humidity. Reads humidity in the range of 20% to 95%. Registers temperature in Fahrenheit and Celsius.